what mysteries and secrets that hold on this island. Signs have shown that the monsters you face are familiar and seem to reflect the gruesome adventures of realmers. Characters with un-maxed Defense and Speed should traverse this dungeon with extreme caution, since enemy projectiles tend to inflict very high damage and undesirable status effects. Additionally, nearly every Ruin Island enemy within has a Defense stat of 100 or more, giving characters with un-maxed Attack a challenge.There are also many kinds of enemies with many different behaviors; moreover, the dungeon is quite long, patience is key. Scroll down for more information about Ruin Island, including the layout, the enemies within, and any items of interest. A strategy guide is available TBA. 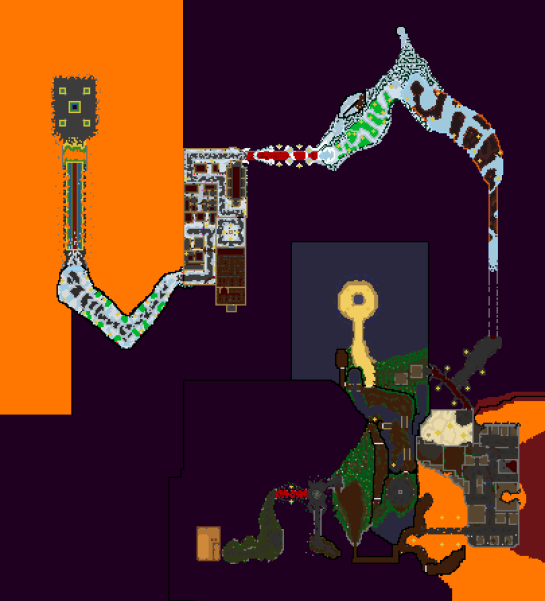 This dungeon's layout is not procedurally generated. It will always look the same. Path through the Bewitching forest. This path is short and relatively easy. Secret Path. In order to open the secret path you have to activate Abandoned Switch 7 and 8.